Potatoes are cool-season crops and can survive light frosts. 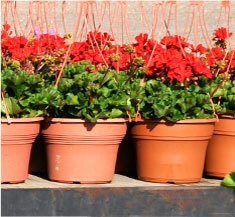 Plant as soon as soil is workable in early spring. Potatoes need fertile, well-drained soil that’s loose and slightly acid (pH 5.8 to 6.5). Hard, compacted soil produces misshapen tubers. Amend heavy clay soil the fall before planting by working organic matter into planting beds. Potatoes form tubers 4 to 6 inches below the soil surface. When stems reach 8 inches tall, draw soil up and around plants, covering half of lower stems. Repeat theprocess two to three weeks later. Potatoes exposed to sunlight turn green, which causes flesh to taste bitter. Keeping tubers covered prevents greening. You can plant your potatoes in a patch of land, or you can put them in a planter on your patio – large pots, a stack of tires and old chimney pots all work well. The most important thing is making sure your soil is as weed-free as possible. 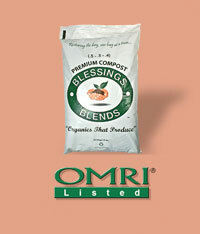 Additionally, apply Blessings Blends OMRI-Listed Premium Compost (.5 – .5 – .4) for best results. Maximum tuber formation occurs when soil temperature is 60 F to 70 F. Tuber formation stops when soil temperature hits 80 F. Mulching soil with straw or other organic matter can help reduce soil temperature. Research has shown that maintaining a 6-inch-thick straw layer around potatoes keeps soil temperatures 10 degrees lower. Potatoes are sensitive to drought. Keep plants consistently moist, especially when plants flower and right after, since this is the peak time when tubers are forming. Move potatoes to a different place in the garden each year to help limit disease and insect problems. For best success, rotate potatoes on a 3-year program, growing them in a different spot for three years in a row before cycling through the growing spots again.